← Yeah, there’s been a bit of rain, but we should be ok! I had caved with David S a couple of times and he knew I was a bushwalker so when he was making plans to go over to NZ in February and walk the Heaphy Track (80k) he asked me if I’d be interested. Straight away I said “yes”, didn’t even need to think about it! In the end there were 9 of us, JV (David’s climbing/caving friend), Anne and Jane (David’s dancing friends) and four Queenslanders (Paul, Shirley, Linda M and Linda S) two of which David and JV had met on a European trip. 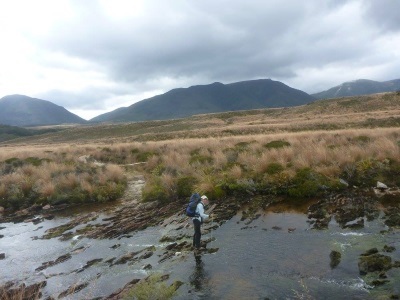 David and JV’s idea was to walk the full Heaphy Track but instead of doing it in three or four days like everyone else, we’d take 7 days and stay at all of the huts on the route, this meant that there were some days that we’d only walk a few k, sounded ideal to me. This isn’t so much a report on the trip, you can find out all you need to know about the walk on the net, it’s more about why you should do it in seven days and what you miss if you only do it in three or four! We all met up at Nelson and got to know each other, it’s a little daunting setting off on a 7 day adventure with 8 other people, only one of which you know! DAY 1: We had breakfast at a café beside the river at Nelson, then caught a bus to the beginning of the track at Golden Bay and started the 16k up hill section to Perry Saddle Hut which took us about 5 hours. It was a very humid day and then we walked up into cloud/fog, so we didn’t get the views of the valley which was unfortunate. It was a tired group that walked into the Hut, after all, we were all carrying 7 days of food. We all wandered down to the swimming hole nearby, this was really pretty, but not very big, I managed to go a little ways upstream to find a nice spot for a wash.
DAY 2: Despite trying to sell the side trip there were no takers and I walked up Mt Perry while everyone else headed off for the next hut, Gouland Downs (1 ½ – 2hrs away). The track up to Mt Perry was well defined, until you got to the top, then it started to be a bit more difficult to follow as it went over granite rocks. Whilst up there I watched a heli-evac, apparently one of the people staying at the hut had fallen the day before and had a nasty cut in her mouth which needed medical attention. It was fascinating watching the helicopter come in and land. After getting my fill of the views (and there were great views, the weather was fabulous and there were mountains as far as the eye could see), I retraced my steps back down to the hut, picked up my pack and continued on to Gouland Downs, passing the boot tree on the way (obviously those in the “know” knew to bring along old shoes to leave behind, plus lots of high-heals, a pair of ballet slippers and lots of thongs. This is a nice little hut, one of the original ones and only sleeps 8 or so, so, we had the hut to ourselves which was great. 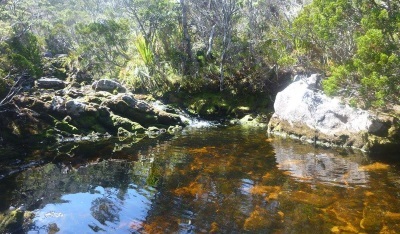 Once we’d regrouped, we all went down to the creek which was crystal clear and there was a big hole for swimming, the water was cold but it was good to sit around in the sun for a while. After a while David and I went off looking for a cave in the area that Dave had spotted the last time he was here, you can actually see it from the track as you cross the swing bridge. Paul joined us and we scouted around and finally found the entry into the lower part of the cave, so we dropped down into it and Dave took some time to do some filming. You couldn’t get into the cave from the bottom but eventually we found the entry way near the top of the cave which allowed us to get right inside. 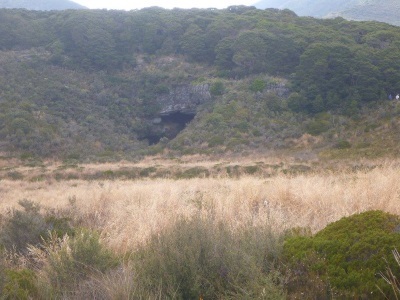 The area is a mass of caves, looks a lot like Lord of the Rings country and you could easily spend hours poking around in the area finding more caves. We decided not to as we hadn’t bought torches and overalls and all the slots looked very dusty. 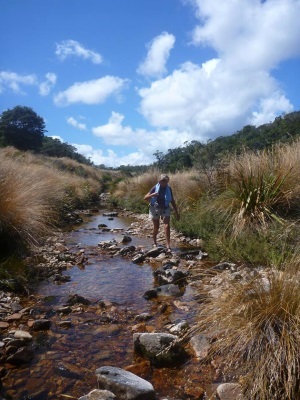 DAY 3: Gouland Downs Hut – Saxon Hut (a short 1¼ hrs, very easy). We crossed the downs and then the river on a swing bridge, Anne tried to get across without using the bridge but eventually gave up and trusted it. Eventually we arrived at Saxon Hut, this hut was slightly larger than the previous one but once again we had it to ourselves. Being there so early, we walked down to the swimming hole and then I convinced one of the Queenslanders (Linda M) to walk downstream a ways with me. I was wanting to see if the creek turned into a gorge (which it didn’t) although I did find interesting looking “gold” in the rocks and sand so w went back to the hut and got some “gold panning equipment” and persuaded the other women to come down and pan for gold! Sadly I think it was “fools gold”. While we were searching for gold, David got out the kite he’d carried in and launched it. DAY 4: Saxon Hut-Mackay Hut: 2½-3 hr. Another easy day, we climbed a little into the forest and then came into open country with a creek nearby, five of the group had powered on but the rest of us took the time to sit for a while on one of the small bridges, just taking in the ambiance. There were some large granite boulders in the area, and a track that came in from the right, but have no idea where it went to, it was extremely well worn though (and I think it warrants a bit of exploration)! Mackay Hut is brand new and fabulous, flush toilets, lovely rooms and a large clean kitchen. Again we were there very early and all the girls headed down to the creek to have a wash. When everyone else had gone back to the hut, I followed the stream down for a few hundred metres, there were much better, larger swimming holes downstream. I was hoping to come to a waterfall but after an hour or so turned back, apparently if I’d gone a little further, there would indeed have been a waterfall. We had popcorn for happy hour and that night got out the dominos. DAY 5: Mackay Hut-Lewis Hut: 3-4 hr. By now we are steadily going down hill, making for the coast at one high point you could actually see the sea. Eventually we came to the Hut, quite an old one (one of the original huts), again we had this one to ourselves, most people by-pass this hut and head straight to Heaphy Hut. After getting settled we wandered down to the river and walked upstream. The swimming was good and I was happy to stay there for ages until an eel bit a kid on the toe who was swimming nearby, I decided then that swimming with the eels wasn’t a good thing. We spent the rest of the afternoon at the hut sitting around drinking tea and chatting, by this time, we were getting to really know each other, takes a while when you’re dropped in amongst strangers! This night we played gin rummy and Linda had a crossword that she tried to do (and someone who shall remain nameless tried to play gin rummy and solve the crossword at the same time!). 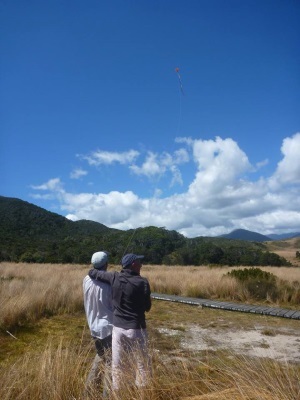 DAY 6: Lewis Hut-Heaphy Hut: 2½ hr. This was one of the highlights of the trip for me. 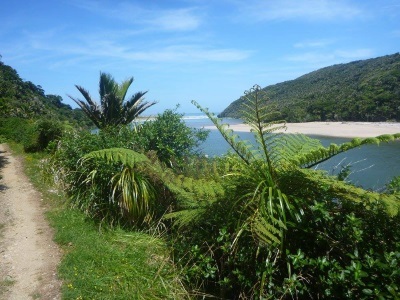 The track is quite flat and winds through palms and there are large limestone cliffs on one side and the Heaphy River on the other side, very scenic. There are a few swing bridges that you have to use to cross creeks, but they’re really only necessary for when the creeks are in flood. Eventually we came to a spot and David and JV decided they’d go off track looking for Field Cave, I tagged along for the adventure. The first spot we tried looked promising, and there were in fact old wooden steps, but we think that this was where the original track went and it’s now dis-used, no sign of a cave. We went on a little further and found what looked like a track off to the right, which we followed, we knew we were on the right path when we started to see some tags. When we found the cave, it was quite large but there wasn’t much decoration in it, it was more like a stream bed. After looking around a while, we continued on to Heaphy Hut, again this is brand new and is the best hut on the track, mind you we had to share it with a lot of people, in fact the hut sleeps about 30 and it was full. After lunch we took a walk on the beach (lovely white sand). 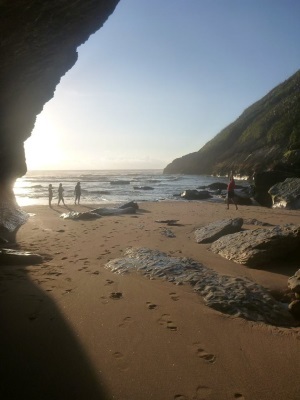 David and JV decided that it would be fun to cross the River on the outgoing tide (almost when the tide turned) to check out the sea caves on the headland so they set the time to cross at 8pm. I was the only other one in our group who wanted to go. We walked down to the river but it was still flowing very fast, so we locked arms to walk across (they got this idea out of an Edmund Hillary book). We had a backpacker come with us, she was really excited about the adventure as I don’t think the backpackers knew the sea caves were there. The caves were fascinating! DAY 7: Heaphy Hut-Kohaihai Shelter: 4 1/2 hr. 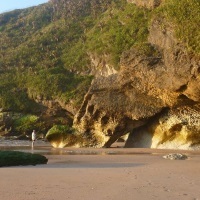 The track wanders along the coastline until it gets to a large bluff and then you go up and over the Kohaihai bluff. This part of the track is probably the most scenic, you get great views of the coast line and the palm forests are amazing, who would have thought palms would grow on the west coast of NZ. We took a short side track up to the Scotts Hill Lookout and took in the views north along the coastline looking back to where we’d come, hard to believe we’d walked all that distance. 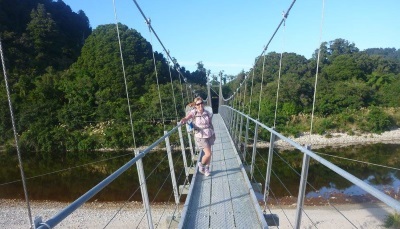 In no time at all we were at the Kohaihai River bridge and then at the end of the track. We had a swim in the river to cool off and then waited for our bus. That evening we all gathered at a Nelson restaurant for a celebratory dinner. Whilst seven out of the nine of us knew David in some way, most of us were virtual strangers, yet by the end of the trip we’d learned a lot about each other and determined that other trips, possibly to NZ and maybe to Hinchinbrook, were on our mutual wish lists, I’d definitely walk with this group again, they were great company and very funny! 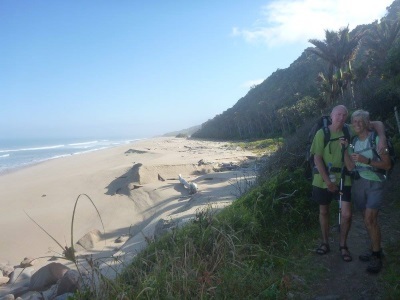 And the Heaphy, I’d definitely recommend taking the seven days, there’s a lot to see that you wouldn’t see with only 3 or 4 days to do it, plus you’d be stuffed at the end of each day whereas we were all fine. Whilst David and JV would do it again, I’m not sure that I would, we had 7 days of perfect weather, you couldn’t replicate that! 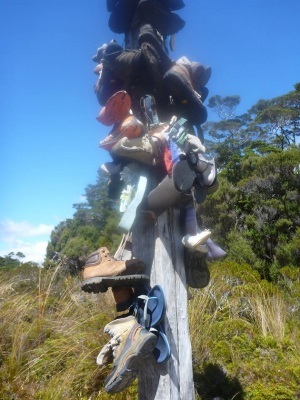 This entry was posted in Bushwalking, New Zealand. Bookmark the permalink.